RE/MAX Sedona, Arizona - No other Sedona office sells more real estate per agent than RE/MAX Sedona. There are offices that are larger, but none that get the job done better. RE/MAX Agents are dedicated professionals, working hard to help you meet your real estate goals. Locally owned and operated, we have the power of RE/MAX International behind us, but are small enough to offer personal, caring service and real insight into the local communities of Sedona and the Verde Valley, including Uptown Sedona, West Sedona, Oak Creek Canyon, Red Rock Loop area, the Chapel area/Little Horse Park, the Village of Oak Creek and Big Park area, Cottonwood, Cornville, Camp Verde, Clarkdale, Lake Montezuma, Rimrock and Jerome. How do we stack up? For the top 3 Sedona Real Estate Companies REMAX Agents consistently sell more per agent. 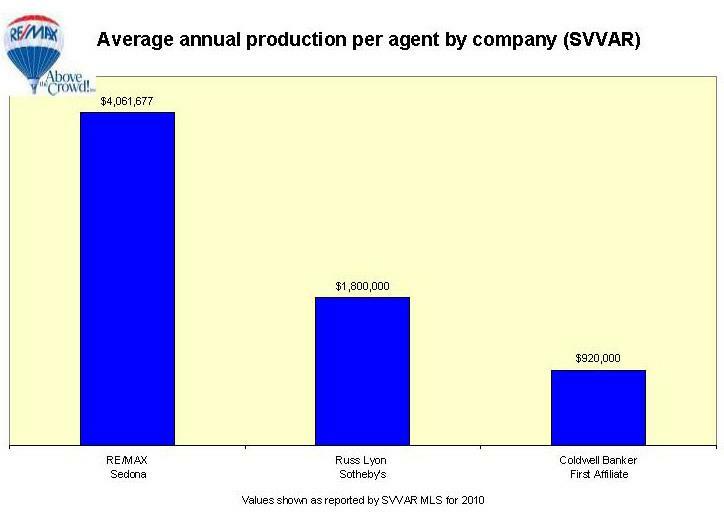 Here is a graph chart for 2010, using data from the Sedona-Verde Valley Multiple Listing Service. Whether you're looking to buy or sell Sedona real estate, as your RE/MAX professional agent Beth Larsen is here to look after your best interests and make you look good while doing it. See buyers searching in real-time for homes for sale across the USA on REMAX.com.